9th: Something Different – Cook a cuisine you’ve never tried before. Or, one you don’t make often enough. I think I am the only vegan left who has not tried Ethiopian food. It isn't anything against it, it's just the the opportunity has never arisen. I have planned to go a couple of times, but things have come up. So today's challenge was the perfect chance to try and make some myself! Sticking with my trusty Vegan Without Borders, I noticed that the main dishes from the African Menu were all Ethiopian, so it seemed like fate. Injera: My first time making injera was also my first time eating injera, so I didn't really know what to expect. I fermented it for two days (the recipe recommends 1-3 days, with longer being better), and it had a sharp, yeasty smell. Mine didn't go very big, I know they are normally huge so you can put lots of things on them. Taste-wise, they had a faint beer taste. 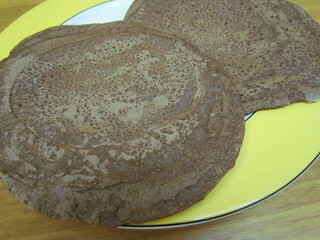 And mine turned out very dark, but that was just the colour that my teff flour was. They were good with the things scooped up in them, though didn't love it on their own. I need to eat some that I didn't make to know if I got the flavour right. Spicy Lemon Chickpeas (Fasting Eggs): This was described as ;like an Ethiopian-spiced lemony hummus, only better'. The chickpeas are mashed and mixed with the seasoning. I used a chopped scallion in place of the red onion (raw onions are not my friend), and I left out the jalapeno. So, given that I just used a teeny sprinkle of chili powder, they weren't really spicy. But that is how I like it. This was lemony and tangy and yummy. All piled onto a plate! Caakiri Pudding with Pineapple: This is not an Ethiopian dessert, but it was with the rest of the menu so I may as well! This dessert ended up kind of like dessert soup, it was very liquid. I am not sure if that is how it was meant to be. First up, because I was cooking for my gluten-avoiding brother, I used some GF couscous. It turns out the GF couscous is corn-based. I found the recipe calls for way too much water for cooking the couscous (I had to drain mine after, even with the switch to GF couscous the basic couscous:water ratio on the packet was the same as if for wheat). 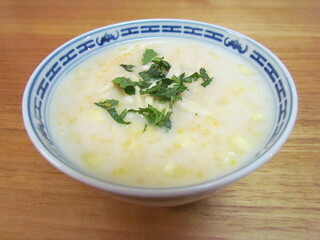 Right after soaking, the corn couscous was still a bit crunchy when I added it to the rest of the ingredients (vanilla yoghurt, oat milk pineapple and spices). However, I had made it early in the day, so it softened up nicely while waiting for dessert. 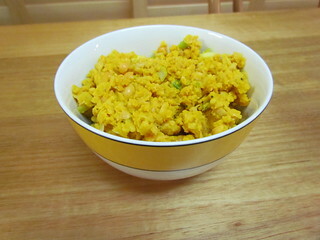 It was perhaps a little firmer in texture than regular couscous, but it was still nice. I loved the almonds and mint as garnishes, the mint I think is essential to finish the dish. (Side note, I am totally wondering if I can use the corn couscous as grits for my US recipes, as it is coarser than polenta and I can't find grits here). I had a fun time putting the menu together. It was pretty simple and turned out to be a lovely spread. I just need to eat some actual injera and then practice some more! Have you had Ethiopian food much? We are circling back around to the start of my kitty all star line up. Back to sweet Mo, my first cat. It is a tough life being the cat of very young person, but thankfully Mo was always very tolerant of my youthful and enthusiastic hugs! Oooh, I'm glad to see that injera recipe worked for you! I tried that same recipe last year, and I accidentally used teff grain instead of flour, so I failed. Totally my own fault. I need to try it again. Yours looks perfect! Also, I think you could probably use that corn couscous in place of grits. Sounds very similar. I remember reading your post where you used the grain by mistake, so I made sure to have the flour! I've never had Ethiopian food! There are no ethnic food places were i live, 'though i could always try making something myself... Being the bread maker I am i'd probably enjoy trying out injera! I am terrible at making actual bread, but flat breads I can manage! I still haven't tried Ethiopian food; yours looks good, though! :) Mo looks like she was a very calm & patient kitty haha! One must be a calm and patient kitty when one has a tiny terror wanting to hug her! From your description and pictures, your injera sounds right to me! I always thought it tasted a bit like sourdough. I also don't like it on its own, but it pairs SO well with other dishes. I especially like it with the lettuce/tomato/tangy vinaigrette salads from Ethiopian restaurants! Glad to know it sounds like I got it right! We had a new Ethiopian restaurant open up here earlier in the year and we love it! So much that I raced out and bought Teff Love but I am yet to make any recipes from it. Must remedy that! I don't have Teff Love, but I have heard only good things about it. "I think I am the only vegan left who has not tried Ethiopian food." Nope! Ok, well, I've tried it once. But I have never made it (aside from this MoFo prompt). Great minds think alike! 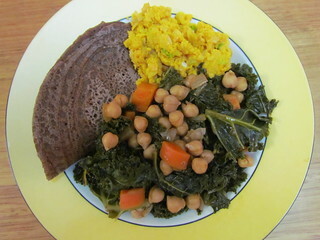 I considered making injera, but it sounded tough, so I skipped it. You'll have to let me know if you try making it again - yours looks good. Everything you made looks really good. A very nicely balanced plate. I feel like I should try more Ethiopian food too, to get a sense of what it should taste like so when I make it, I'll know I'm going it right or not. 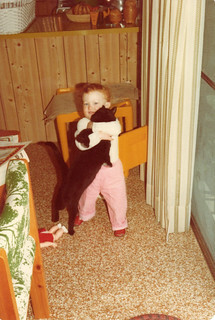 Oh you are so cute hugging your kitty as a little girl! I was mostly just nervous about killing everyone with off injera, but it worked out OK. Definitely keen to try and make it again, though maybe not in the very hot heat of summer! I remember eating Ethiopian food BEFORE going vegan. It was a pretty fun adventure since it is so different. We had no clue that you serve the dishes on top of the injera. 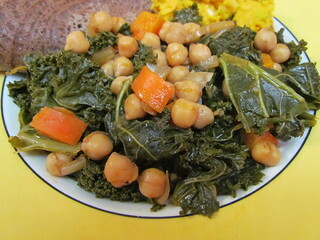 I have a whole cookbook just for vegan Ethopian food, and I haven't picked it up yet. I really should.